Australia is a valuable trading partner of Hong Kong. It was our 7th largest services trading partner in 2017, with total services trade between the two sides amounting to HK$44 billion and our 20th largest merchandise trading partner in 2018, with total merchandise trade amounting to HK$54 billion. As at the end of 2017, Australia ranked 8th among Hong Kong's destinations of outward direct investment, with a stock of HK$134 billion and ranked 17th among Hong Kong's sources of inward direct investment, with a stock of HK$33 billion. Hong Kong and Australia commenced negotiations of a Free Trade Agreement (FTA) and an Investment Agreement in May 2017. The negotiations were concluded in November 2018. The two Agreements were signed on 26 March 2019. The Agreements are comprehensive in scope and the commitments therein are of high quality, encompassing trade in goods, trade in services, investment, government procurement, intellectual property, competition, dispute settlement mechanism and other related areas. They will provide Hong Kong traders and investors with legal certainty and more favourable access to the Australian market, whilst creating more business opportunities and enhancing trade and investment flows between Hong Kong and Australia. 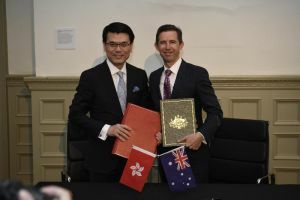 The Agreements will enter into force after Hong Kong and Australia have completed their respective internal procedures. Key features of the FTA (consisting of 20 chapters) and the Investment Agreement are summarised below. As set out in Chapter 2 (Trade in Goods) of the FTA, Hong Kong and Australia are committed to eliminating all tariffs on goods originating from each other upon the entry into force of the FTA. On trade remedies, Hong Kong and Australia agree to maintain their rights and obligations under the relevant World Trade Organization (WTO) Agreements in respect of anti-dumping and safeguard measures. For countervailing measures, the two sides agree to strengthen the notification and consultation requirements. To enjoy tariff-free entry to the Australian market, Hong Kong exporters will need to comply with the relevant preferential origin rules and fulfil the relevant requirements set out in Chapter 3 (Rules of Origin and Origin Procedures) of the FTA. To claim zero import tariffs for exports to Australia, Hong Kong producers, Hong Kong exporters, Australian importers or their representatives may complete a declaration of origin in accordance with Article 3.16 of Chapter 3 (Rules of Origin and Origin Procedures) and Annex 3-A (Data Requirements) to the Chapter. Imports from Australia are not required to be accompanied by a declaration of origin or certificate of origin in order for the goods to enjoy tariff-free treatment. Chapter 4 (Customs Procedures and Trade Facilitation) of the FTA covers commitments of Hong Kong and Australia on customs matters. It seeks to ensure that customs procedures and practices applying to goods traded between Hong Kong and Australia are predictable, consistent, transparent and trade facilitating. Chapter 5 (Technical Barriers to Trade) and Chapter 6 (Sanitary and Phytosanitary Measures) of the FTA provide for cooperation in the areas of technical barriers to trade and sanitary and phytosanitary measures. Chapter 5 also includes Annex 5-A (Wine) and Annex 5-B (Food Products) in order to facilitate trade in wine and food products. 1 Trade remedy measures refer to anti-dumping, countervailing and safeguard measures. Imposition of these measures by the importing economy could result in additional duties (being one of the usual forms) on top of tariffs and other charges or other import restrictions on certain imports. 2 Technical barriers to trade include technical regulations, standards and conformity assessment procedures that may directly or indirectly affect trade in goods. 3 Sanitary and phytosanitary measures are any measures applied to (i) protect human or animal life or health from risks arising from additives, contaminants, toxins or disease-causing organisms in their food; (ii) protect human life or health from plant- or animal-carried diseases or pests; (iii) protect animal or plant life or health from pests, diseases, disease-carrying organisms or disease-causing organisms; or (iv) prevent or limit other damage from the entry, establishment or spread of pests. Hong Kong and Australia service providers will enjoy better business opportunities and legal certainty in market access in a comprehensive range of service sectors. subject to specified conditions or exceptions where applicable. Australia's commitments encompass sectors where Hong Kong has traditional strengths or has potential for development. These include professional services (including arbitration, conciliation and mediation services), business services, transport services, financial services, and telecommunications services. Hong Kong also makes commitments to Australia on a wide range of service sectors. Apart from market access commitments, the two sides have agreed on other obligations to facilitate trade in services. They include tariff-free undertaking for all electronic transmissions and other facilitation measures for e-commerce; improvement of transparency of domestic regulations and streamlining of application procedures for authorisation; provision of dedicated disciplines on financial services and telecommunications; and implementation of future work programmes on educational services, professional services and legal services. Note: Annex I and Annex II above also apply to Chapter 12 (Establishment and Related Provisions). Under the FTA, Australia is committed to raising the monetary thresholds for screening of investments by Hong Kong investors, such that Hong Kong investors will be on a par with investors from most other FTA partners of Australia in this regard. This will help provide a level playing field for Hong Kong investors vis-a-vis other foreign investors investing in Australia. The FTA also contains specific commitments on treatment of investments, which benefit investors of Hong Kong and Australia alike. Note: Annex I and Annex II above also apply to Chapter 7 (Cross-Border Trade in Services). Chapter 13 (Government Procurement) of the FTA sets out commitments of Hong Kong and Australia on market access and rules in respect of government procurement (GP) to facilitate suppliers' access to each other's GP market. Apart from affirming the rights and obligations under the WTO Agreement on Trade-Related Aspects of Intellectual Property Rights, both sides have agreed to promote and strengthen cooperation in the area of intellectual property rights in order to enhance the benefits from trade and investment. The two sides have agreed to promote competition, and to encourage cooperation and information exchange between their competition authorities. A panel may be established if the consultations fail to resolve the disputes.